October Research, LLC and Summit sponsors Windward Consulting | Software – ResWare are proud to bring back this charity event for the 6th year. 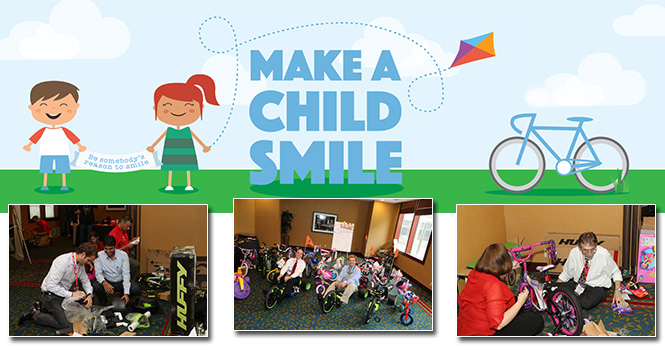 Join fellow attendees, the Windward team and October Research staff in helping to assemble children’s bicycles and big wheels for donation to a local San Antonio non-profit organization. A few minutes of your time will bring joy to local children for years to come. This is the 6th consecutive year and so far over 150 bicycles have been built and donated to local charities where the Summit is held. Now the Summit will be providing smiles in this year’s host city of San Antonio. Plan to add this wonderful event to your NS3 schedule. At the 2012 Summit, October Research, LLC launched its first charity event with the support of Windward l ResWare and the volunteer efforts of Summit attendees. Each year since the event has grown in popularity and we’re looking to make 2017 the best yet. Thank you to all who have contributed your time and effort over the years to make this community outreach program a success.